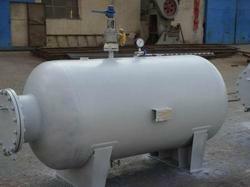 To fit the needs of our customers, we are engaged in manufacturing and supplying a peerless range of Storage Tanks. High in performance, our offered storage tanks are manufactured using quality-approved stainless steel & Mild steel, and our offered tanks can be customized as per the requirements of our clients. Banking on the capability of dedicated team, we are readily engaged in the realm of offering a varied series of Filling Vessels. Capacity: 0-20 L, 20-100 L, Between 2 liters to 200 liters.